In February, work began to level and earmark proper beds in the vegetable garden, plots were measured and marked out, levelled and built up around the edges to maximize the water use in the dry season. In early April, work continues in the vegetable garden. The area has been levelled with the help of a team of donkey’s ploughing the land into workable furrows for tilling and the planting beds have been prepared for winter crops. There are additional funds on their way from Rotary and these will be used to clear the southern portion of the garden of rocks. These funds will also be used to add irrigation pipes to the southern section of garden, purchase seeds and upgrade security of the new infrastrucure. 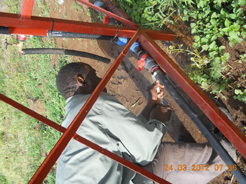 For now though, Manyike has attached a length of 50m irrigation pipe to the tank outlet which will provide water to the cultivated northern half of the garden. Smilling and Harry continue to work to secure community support and involvement for their project. Through continued meetings with the village headman, the municipality, local farmers and members of the department of agriculture, churches and other non-profit organizations as well as from community members themselves, the project gains momentum, going from strength to strength.